The 2016 Morrow County Junior Fair King and Queen will be crowned Aug. during ceremonies that begin at 6:30 pm in the Junior Fair Youth Building. Crowning the new royal couple will be the 2015 king and queen, Lauren Hall and Collin Berg who will also emcee the program. There are eight candidates: Hannah Bush, Kayla Eubank, Marissa Hall, Cassady Neviska, Miranda Harvey, Adam Barrett, Darren Bush, and Zachary Parrott. Bush, 17, is the daughter of Mike Bush and Debbie Bush and is a senior at Mount Gilead High School She is an eight -year 4-H member and currently belongs to Bar H 4-H Club. School activities include student council ( president last year and the coming year); National Honor Society, Pep Club, Cross Country and track ( high school) and indoor track. She has been attending the Morrow County Fair for 13 years showing livestock for eight of those years and attended 4-H camp during the summer, the past two serving as camp counselor. Her community service projects include helping at Flying Horse Farms, blood drives and concession stands at local sporting evens. Eubank, 17, is the daughter of Lonnie Eubank, Jr. and Tricia Wright. She is a 2016 graduate of Cardington-Lincoln High School and has been involved in 4-H for four years, FFA four years and on the junior fair board for one year. She has been active with bowling and band, serving as vice president four years. She often volunteers for many activities and events. She will be attending Wilmington College this fall. Family 4-Hers Club. In school she belongs to the Spanish Club, Book Club and Improv. During high school she has played softball, varsity volleyball and club volleyball. She is a seven -year member of the National Junior Angus Association where she is the committee chair. She has been a camp counselor and participated in Public Speaking and parliamentary procedure in FFA. Neviska, 16, is the daughter of Tim and Mary Neviska and is a senior at Buckeye Online School for Success. She is a nine-year member of 4-H; secretary of the National Honor Society, French Club, French Honor Society, a library volunteer, dog pound volunteer, a Katies Krops grantee and a volunteer with the Flying Horse Farms. She has attended leadership camp and workshops and is currently vice president of her 4-H club, the Birds ‘N Buck-shot Club. 4-H Club and three-year Northmor FFA member. She is secretary of the school’s student council, teacher with Douce Dance Studio, a member of the Kicking Cancer team, served as a volunteer with the Nature Center at the Mount Gilead State Park, and belongs to the Northmor Leadership Group. She is a volunteer with Vacation Bible School at Johnsville UMC. Because of her passion for leadership, she feels she can inspire youth to become involved and set goals. Barrett, 17, is the son of Daniel and Jaime Zeger and a 2016 graduate of Northmor High School. He is a nine-year member of Friendly Farmers 4-H Club and a four-year FFA member. He has been on the junior fair board three years, a church youth group leader for ten years. He has played baseball nine years, football, eight years, power lifted three years and wrestled for three years. He was a king candidate in 2015 and hopes to achieve that goal this year because he is willing to travel to Ohio’s many fairs with the new queen. Bush, 16, is the son of Anthony Bush and Jodi Moss and a senior at Mount Gilead High School. He is a three-year FFA member. He likes talking to people and attending other county fairs . Parrott, 17, is the son of Ken and Patty Parrott and a senior at Northmor High School. 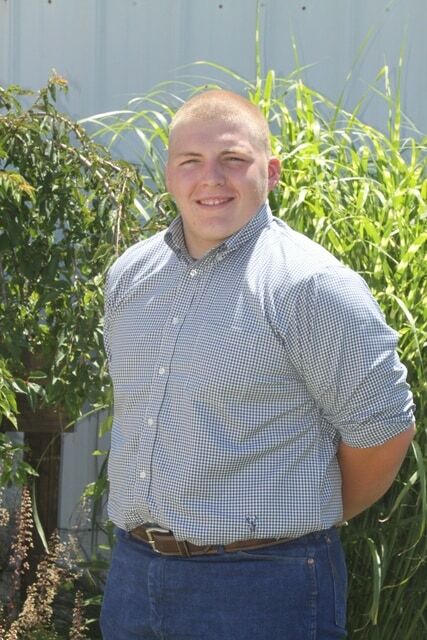 He is a three-year FFA member and has been on the junior fair board two years. Zachary has played basketball three years; AAU basketball four years and football one year. He is a three-year PALS member; belongs to the National Honor Society, and is a three-year Knight Sounds performer. He was a member of the high school musical cast two -years and for three -years has belonged to the Ohio Sheep Improvement Association. He feels his best qualities are his work ethic and his competitiveness. This has been a factor in his showing of sheep at the Ohio State and Morrow County Fairs. Prior to the king and queen ceremony the annual Royalty Dinner will be served at 5:30 p.m. in the youth nuilding. It is sponsored by the Morrow County Cattlemen’s Association, the Morrow County Pork Producers, the Morrow County Dairy Producers, the junior fair board and the mothers of the current king and queen.